‘Frank, enraging and captivating.’ The New Yorker Australian writer Geraldine Brooks is now known internationally for her bestselling novels, but as a foreign correspondent Geraldine spent six years covering the Middle East. And when her poised and sophisticated assistant at the Cairo bureau of the Wall Street Journal suddenly ‘adopted the uniform of a Muslim fundamentalist’, Geraldine Brooks set out to discover the truth about women and Islam. Sometimes adopting a chador as camouflage, she was granted meetings (and often astonishingly intimate insights) by everyone from Queen Noor of Jordan to former Iranian President Rafsanjani’s daughter. She met with Palestinians protesting about ‘honour killings’ for adultery and sheltered girls transformed into warriors by the Emirates’ armed forces. Throughout the Middle East, Brooks was invited into the homes and lives of these women where she found real stories that overturn western stereotypes. This beautiful new edition includes a powerful new Afterword by the author. Geraldine Brooks is the Australian-born author of the bestselling novels Caleb’s Crossing, People of the Book, Year of Wonders and March, for which she won the Pulitzer Prize. 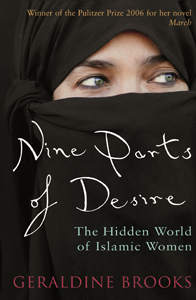 She is also the author of the acclaimed non-fiction works Nine Parts Of Desire and Foreign Correspondence. A graduate of Sydney University and the Columbia University Graduate School of Journalism, Brooks was a correspondent for The Wall Street Journal in Bosnia, Somalia and the Middle East. "What a coup for a really good journalist! This is an exploration of a topic which has shaped aspects of global society for at least 1300 years – a ‘secret’ topic, a source of mystique outside Islam, but basic to Islamic societies. The result is a great book, with vital information for the current ferment over women's rights. This is no dry discussion, but a journey through meetings, regions, and generations, that takes us into the rich detail of countless women's lives."